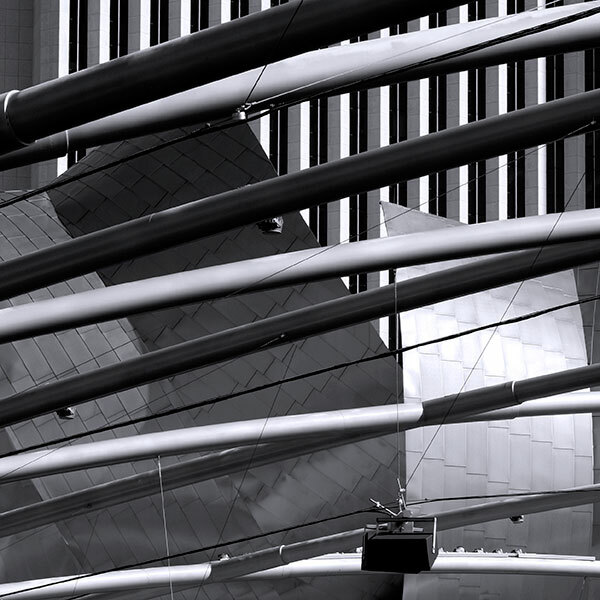 This gallery contains a set of square, closely framed, black and white images of details from the architecture of Chicago. As ever I'm interested in the abstract qualities of line, shape, pattern, texture, contrast, tone and repetition. 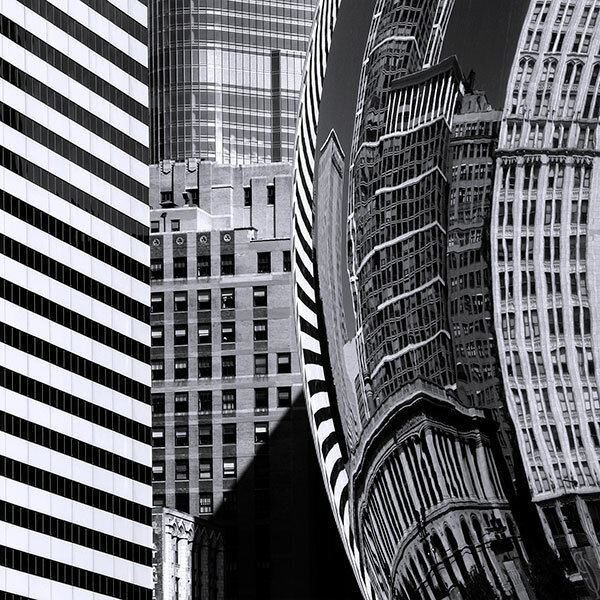 Here, Epstein & Sons' Smurfit-Stone Building of 1984 and Anish Kapoor's reflective 2006 Cloud Gate frame other buildings on North Michigan Avenue whilst the 2009 Trump International Hotel & Tower designed by Adrian Smith with Skidmore,Owings and Merrill closes the view.
. 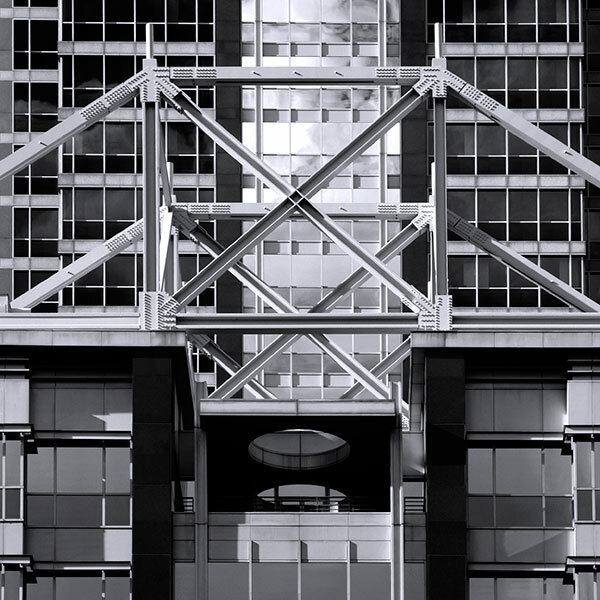 Designed by Perkins & Will and completed in 1990,125 South Wacker Drive houses the headquarters of the Boeing Aircraft Company. It occupies some of the “air rights” space over tracks to the Union Station; train operation was uninterrupted during construction: the tower element has 36 floors. Those of the lower horizontal extension are suspended from the steel trusses visible in the image. (There are several other Chicago architecture galleries to see on this website.) The Skidmore, Owings & Merrill design places a glazed atrium between a fifty-seven storey tower and one of some twelve floors. This image shows the stepped steel truss structure supporting the atrium glazing. Its profile echoes the perpendicular saw tooth setbacks featured on the enclosing towers. 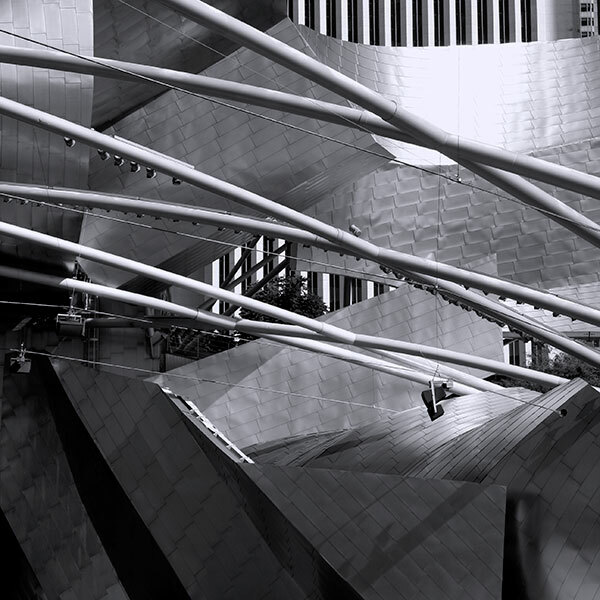 The 2004 Jay Pritzker Pavilion by Frank Gehry is an outdoor performance venue. The tubular trellising supports lighting and a sound system said to replicate the acoustic of an indoor concert hall. His radically different buildings and their inherent handling of forms, surfaces, materials and colour exert a strong personal appeal. Images of this building are in the CHICAGO ARCHITECTURE - MAINLY BLACK & WHITE gallery and those of his EMP Museum building in Seattle are in the SEATTLE CONTEMPORARY ARCHITECTURE 2 gallery. Over a decade ago I explored as much as possible of Anton Gaudi's buildings in and around Barcelona. The hours spent observing builders at work within the Sagrada Familia are particularly memorable. To then cross Spain to Bilbao by train to see the equally idiosyncratic designs of Frank Gehry at the Guggenheim Museum completed a masterly architectural double. 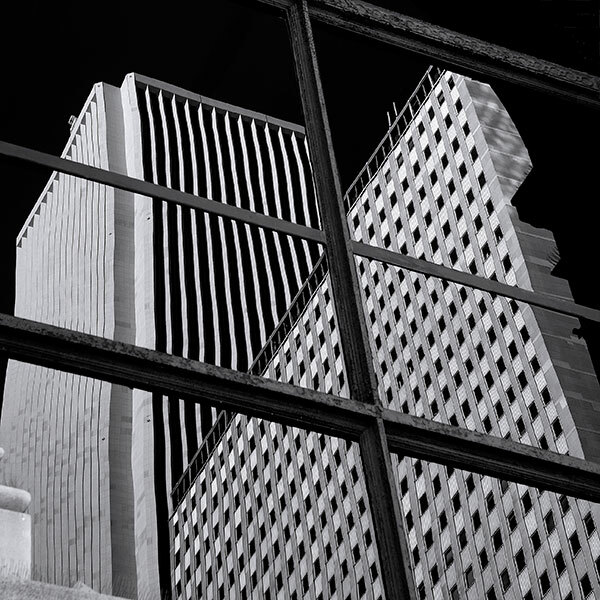 Window glazing on the Chicago Cultural Center on Michigan Avenue carries a reflection of 1 Prudential Plaza and the Aon Center on East Randolph Street. I'd liked to have devoted more time to recording architectural reflections but there were so many other competing themes and limited time. Walking, riding the L amongst the buildings, sailing the river ferries, looking at even a fraction of the magnificent collections at the Art Institute of Chicago and Frank Lloyd Wright's Oak Park houses took time. 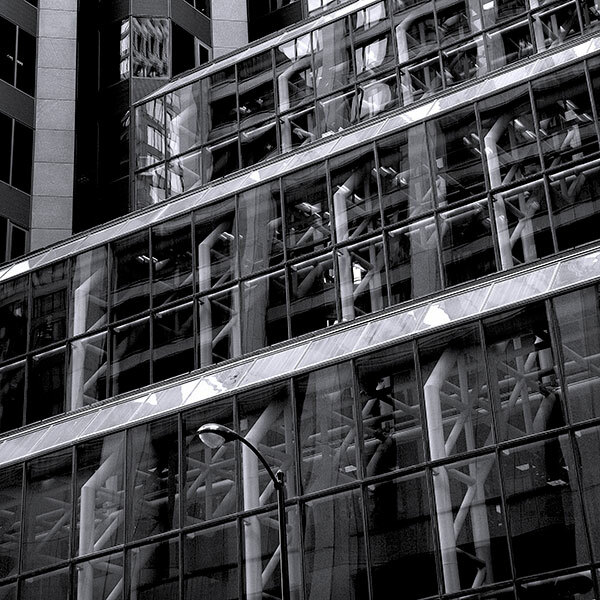 Multiple setbacks, angled corners and sheer tinted glazing enhance daylight at street level. The contrasting light and dark glass shimmers and reflects. An open space separates this entrance from the sidewalk and the twin-carriageway of South Wacker Drive. 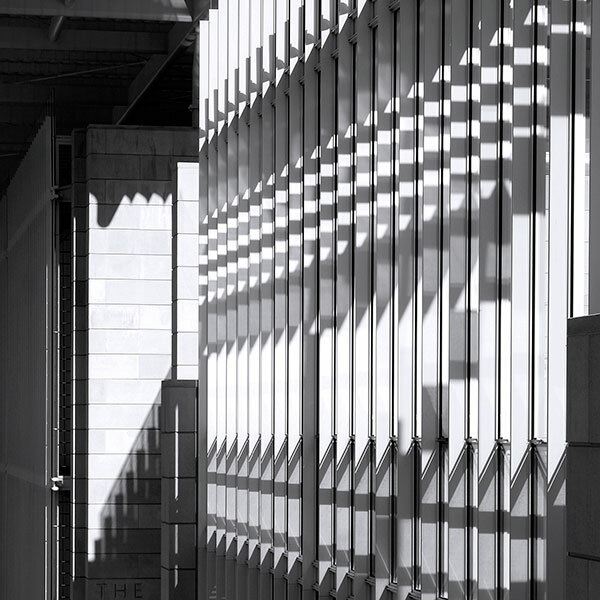 The Hyatt Center's silvery stainless steel skin and seemingly aquamarine glass reflect light into the shaded streets of the area and in this evening light the building glistens amongst its darker masonry neighbours. 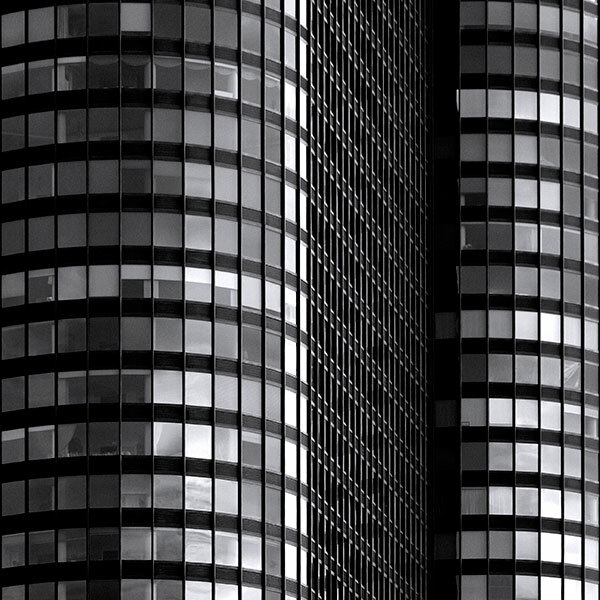 Swissotel: Harry Weese & Associates 1989 > Aqua: Studio Gang Architects 2010 > Three Illinois Center: Fujikawa, Conterato, Lohan & Associates 1980. William Zimmerman designed the ten-floor Dennehy Building completed in 1913. Its large windows were set into a slender framework clad in white-glazed terra cotta tiles removed in a 1950s refit. Acquired by the College c.2010 a new glazed façade was fitted during renovations. Digitally printed in ceramic inks, the songbird dots create a ghost image of the underlying original structural frame. Apart from aesthetic and historical associations it's a practical deterrent to birds which might fly into otherwise clear glass. 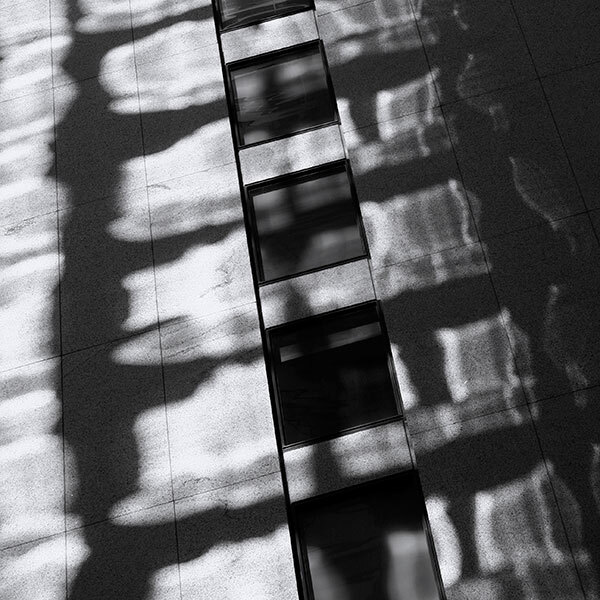 In afternoon shadow I'd been photographing Alexander Calder's ‘Flamingo' sculpture against the façade of Mies van der Rohe's Federal Building. Two of those images are in the Structures 5 gallery. 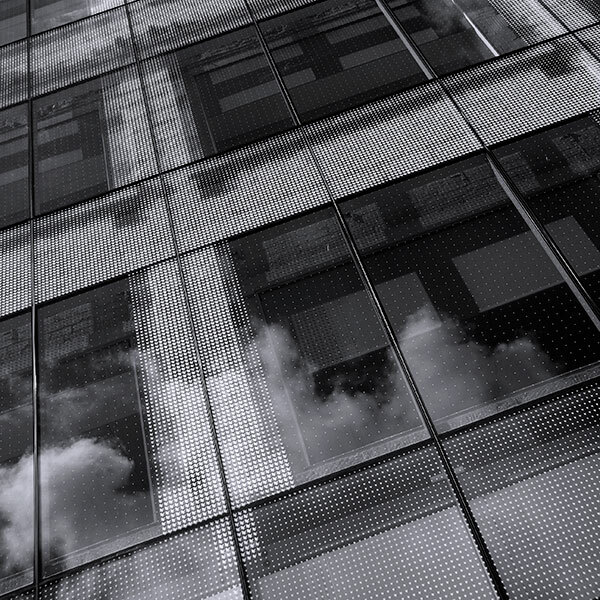 Walking away under slanting sunlight I noticed abstract patterns reflected from a nearby glazed facade flowing across this solid panel and window strip grid. 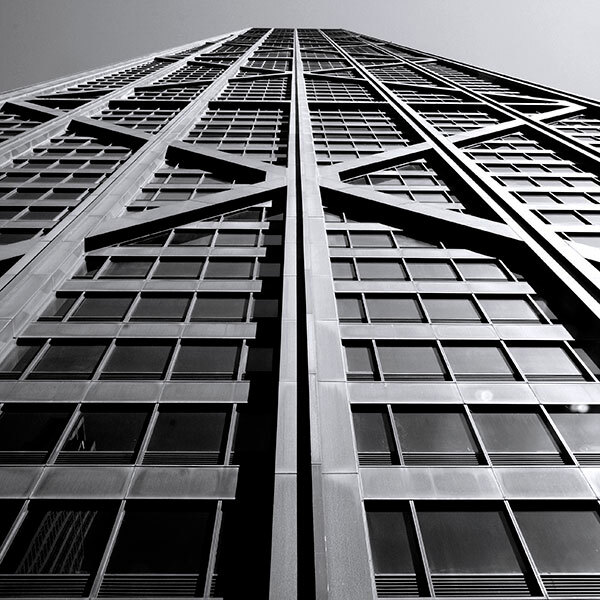 The tapered grey facades of the 100 storey John Hancock Center dominate the North Michigan Avenue skyline. The strong perpendiculars and cross bracing of the steel exoskeleton is a powerful piece of design and engineering containing the inset glazing. 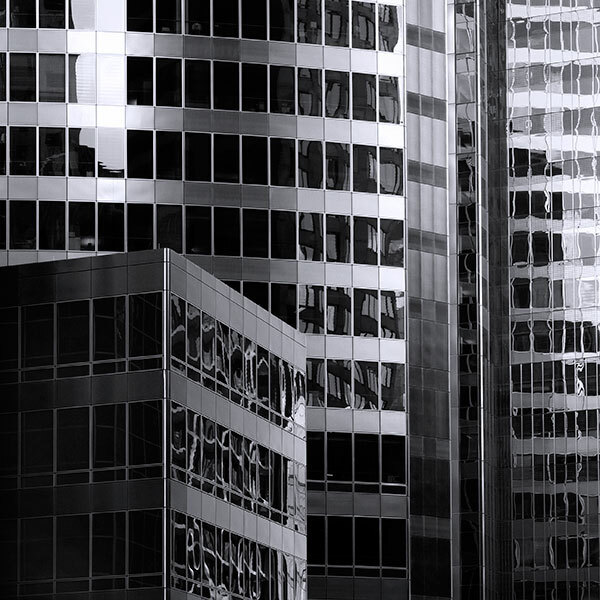 Perhaps a little overpowering in close proximity it gains visually when framed by other buildings. Its observation deck at some one thousand feet gives fine views of the city and the Lake Michigan shoreline. Boston architects Shepley, Rutan & Coolidge designed the Art Institute of Art's main building in Beaux Arts style as part of the 1893 World's Columbian Exposition. 2009 saw the completion of The Modern Wing designed by Enzo Piano as a steel, glass and stone pavilion set under a seemingly floating slatted roof. It's linked north to the Millenium Park by this long and soaring steel footbridge said to be inspired by the form and cross section of a wooden racing boat shell. It offers a visually stimulating walk. The new structure sits alongside an earlier extension to the 1893 building built at the other side of commuter rail tracks. Slim vertical blades are a feature of the new design, here backlit by August afternoon sunlight cutting through the northern façade on East Monroe Street. 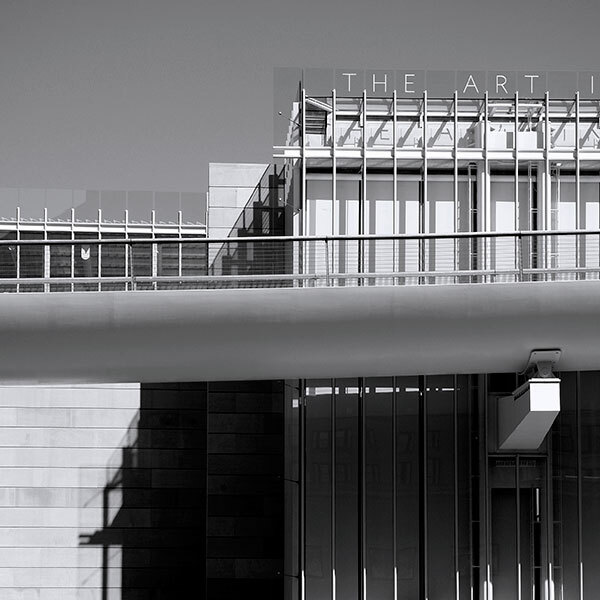 The new exhibition space makes the Art Institute the second largest art museum in the United States after New York's Metropolitan Museum of Art. 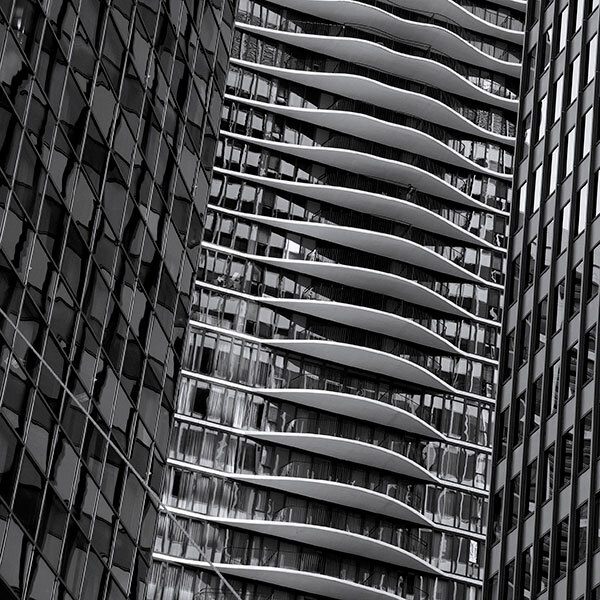 The CHICAGO ARCHITECTURE EAST OF MICHIGAN AVENUE gallery contains four coloured images of the Modern Wing. This is a detail from the entrance façade facing the Cityfront Plaza gardens. 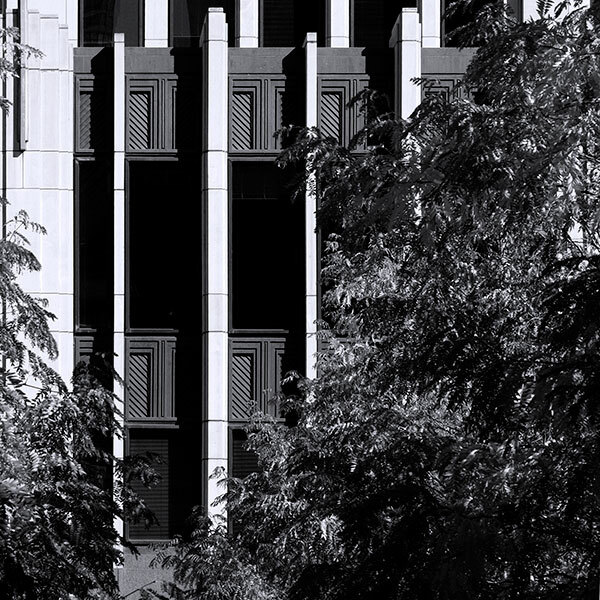 Its great height is emphasised by vertical piers and a series of setbacks echoes the Art Deco styles of Holabird and Roche's late 1920s designs in stone for the nearby 333 North Michigan Avenue and the Chicago Board of Trade. Rising fifty-four floors, this apartment building stands close to the Lake Michigan shoreline. Built to a triangular ground plan, its straight sides curve into a cylindrical form at each corner, shown in this detail. It stands amongst a visual variety of high-rise buildings constructed south of the Chicago River close to the Lake Michigan shore. 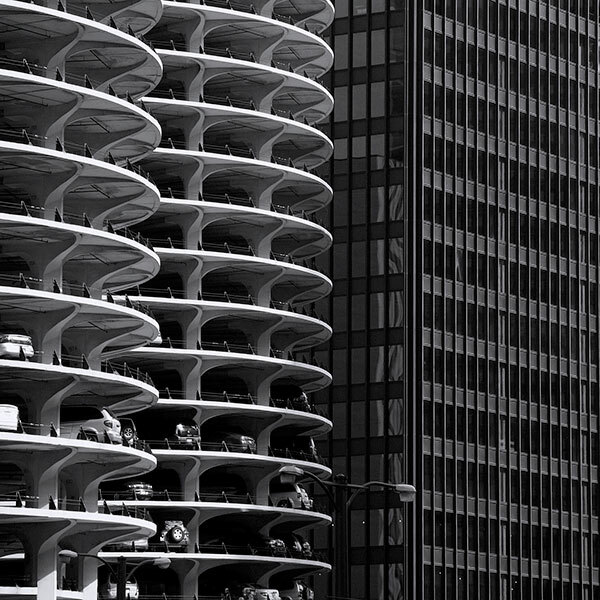 The twin concrete cylinders of Marina city stand in great contrast to the adjacent dark metal and glass of the IBM Building's elegant cuboid simplicity. Bertrand Goldberg Associates' design gives the major floor space to ‘pie-slice' floor plan apartments with curved balconies offering fine views, particularly over the river. Below, these decks provide parking for some 900 cars in each tower: lifts and services occupy the central cores. Commercial firms operate in conventional spaces at river esplanade level. 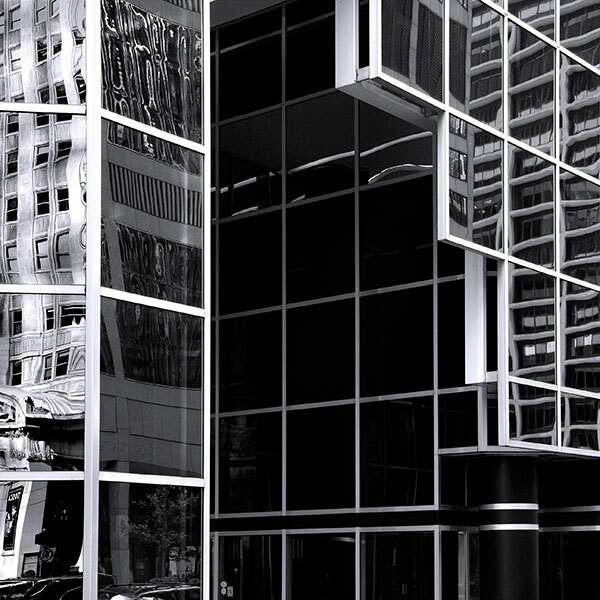 The IBM Building (now AMA Plaza) was Mies van der Rohe's last Chicago design. To its east the smoothly glazed and much taller curving forms of the Trump Tower echo the cylinders of the Marina City to the west. 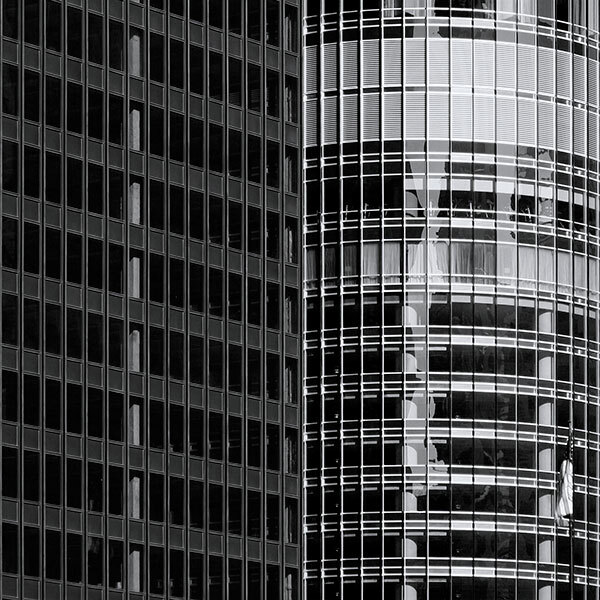 The massing of forms, the reflective surface qualities of glass set in shining metal and the 98 floor height dominate its setting by the Chicago River. In sunshine under clear skies its surfaces glitter in blue and silver.